Sometimes my most favorite projects start out as either an experiment or a mistake - in this case it was an experiment. I wanted to try the Inked Embossing Folder technique with the new Snowflake Embossing Folder from the Holiday Mini Catalog. So, I pulled out a piece of Crumb Cake cardstock, just intending to play with it. Well, I inked the embossing folder with Whisper White Craft Ink using my Brayer and after placing the cardstock in the folder, ran it through my Big Shot. But, I thought, well, that's gonna take a while to dry, maybe I should heat emboss it. So, I pulled out my Iridescent Ice Embossing Powder and my Heat Tool and well, just look! Isn't it a cool effect? I love the raised Crumb Cake snowflakes on the sparkly background! 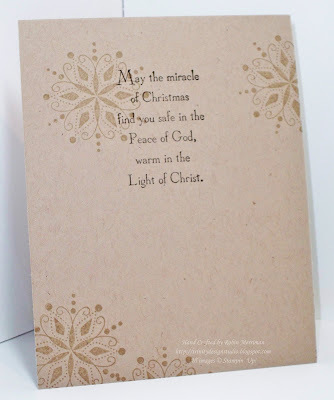 The Crumb Cake cardstock combined with the Iridescent Ice embossing powder gives the Whisper White Craft ink a look more like Very Vanilla - very creamy, yet sparkly! So after that, the rest was easy! I cut a piece of Crumb Cake cardstock at 4 1/4" x 11" and folded it lengthwise and then random stamped a snowflake from the Snow Swirled stamp set on the front using Crumb Cake ink. For the embellishments, I wrapped a piece of Very Vanilla Satin Ribbon around the layered cardstock pieces and secured it on the back. Then I added a piece of Early Espresso 1/8" Taffeta Ribbon over that. 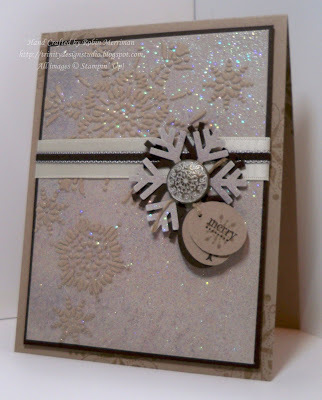 For my focal point, I punched two snowflakes with my Jumbo Snowflake punch, one from Early Espresso cardstock and one from a piece of sparkly Crumb Cake cardstock that I'd heat embossed the same way I did the background. Using my Paper Piercer and Mat Pack, I added a hole in the center of each and attached them together through the background layers with one of those amazing Antique Brads! Seriously, I LOVE them! The greeting was made with the Tiny Tags stamp set and the new 3/4" x 15/16" Oval Punch (yes, that punch needs a simpler name! LOL!). I just stamped the images I wanted using Early Espresso ink on Crumb Cake cardstock then punched them out. 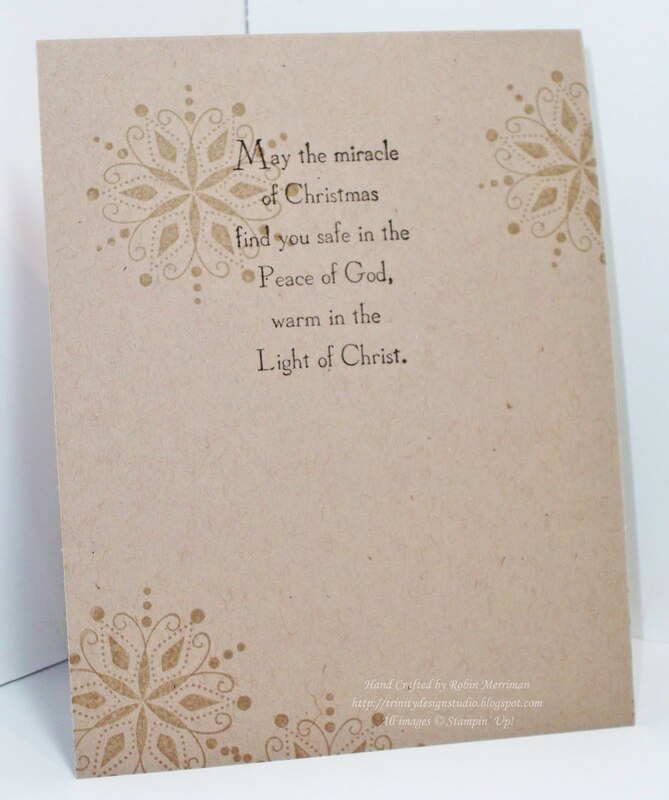 They were strung on a piece of Linen Thread which was wrapped around the brad to hang loosely from the card front. So easy! Not to leave the inside empty, I simply added some Crumb Cake snowflakes there and a greeting in Early Espresso from the God's Blessings stamp set. This might end up being one of my favorite cards this season and is definitely in the running for my WOW Christmas Cards classes next month! 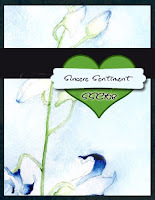 I hope you like it too and if you do, be sure to leave me a comment! I love hearing from you all! Be sure to visit the Stamping 411 blog as well and see what the other operators created from this sketch - I know you will be inspired to play along with us! Robin.. this is just gorgeous! (Well, all of your cards are, but I really love this different effect!) I'll have to try this out! Excellent technique GF! I really love it! I love the vintage bling, and the ribbon. Beautiful job! 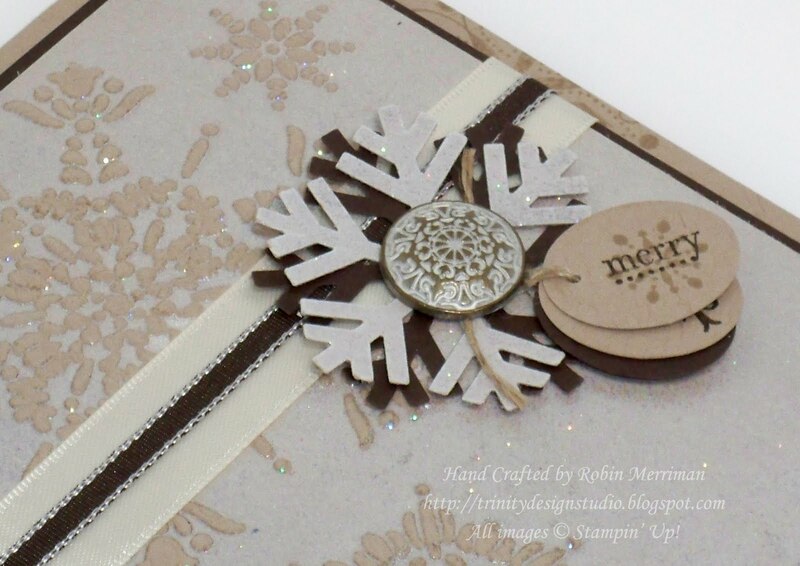 Great job Robin, I love the effect of the embossing powder and that embossing powder, very cool looking. Well I can see you got your mojo back in a BIG way, this is stunning!!! Oh Robin! This is so cool! I am going to have to try that technique too! Thanks so much for the inspiration gf! This is SO cool! I love the card...thanks for the details on how you did it! Beautiful! WOW WOW WOW this is oh so stinkin' awesome Robin!!! I love it and would love to see it show up in my mailbox!! Great job and wish I was going to see you tomorrow!! I have been trying to come up with a card using that folder for my clubs this month and I love your idea and the technique - I actually showed the brayered folder last month to one group but perhaps I need to take it a step further like you did with the card. Beautiful for sure! Just beautiful. I am going to try to duplicate it this afternoon!